Female scale cover circular, thin and translucent, with female body showing through; exuvia marginal. Male scale cover similar but more oval-elongate and smaller. On bark and leaves (Miller & Davidson 2005). Adult female with 3 pairs of lobes, the median lobes well separated, each with 1 conspicuous notch each side then triangular to apex, with a long ventral basal sclerotisation arising from the point of each notch; 2nd and 3rd lobes bilobate, with rounded lobules and ventral sclerotisations. With 1 pair of ‘fish-tail’ gland spines in medial space, lateral gland spines normal, then becoming very short on prepygidium. 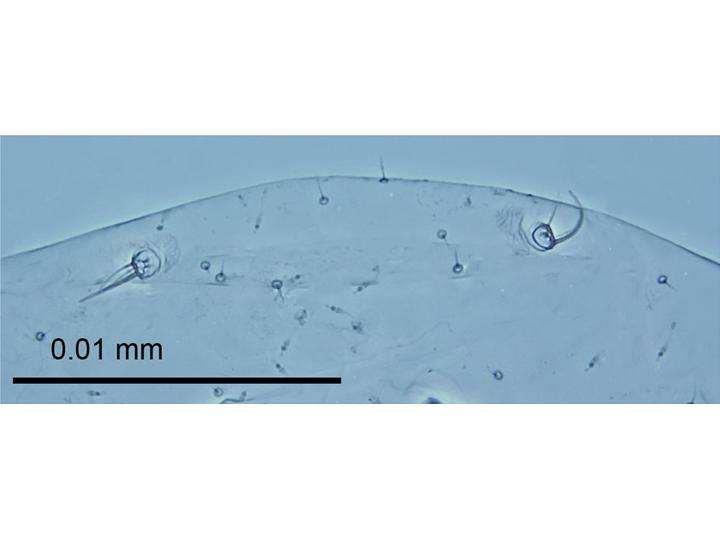 Marginal macroducts and dorsal ducts 2-barred,decreasing in size from largest on VII and present submarginally to segment V. Antenna with 1 stout seta and 1 or more fine setae. Pores absent by spiracles. Perivulvar pores present in 5 groups. Microducts scattered on dorsum and venter. Keys: Miller & Davidson (2005). Colón-Ferrer & Medina-Gaud 1998: 126 (female) [Key to species of Pseudoparlatoria of Puerto Rico]; Kosztarab 1996: 409 (female) [Key to the genera of the subfamily Diaspidinae]; Danzig 1971d: 845 (female) [Key to species of family Diaspididae]; Ferris 1942: SIV-446:62 (female) [Key to species of Pseudoparlatoria]; MacGillivray 1921: 314 (female) [as Carulaspis parlatoroides; Key to species of Carulaspis]. Henderson, R. C. & Crosby, T. K. (2011) False Parlatoria Scale (Pseudoparlatoria parlatorioides ) Updated on 4/17/2014 3:20:39 AM Available online: PaDIL - http://www.padil.gov.au.